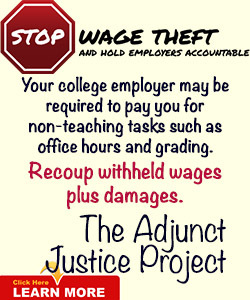 Who should represent the hundreds of thousands of adjunct faculty members on our nation’s college campuses?….It is true that all three of the major faculty unions (AFT, NEA, and AAUP) have now issued strong policy statements about adjunct faculty members. But I see little effort on the part of the nationals to enforce their own policies among the local affiliates. As a result, most of the faculty-union chapters have come nowhere near implementing the official policies of their own national organizations with regard to adjuncts.”—Dr. Keith Hoeller, “Union Matters,” Chronicle of Higher Education, May 2004. Re’s letter includes accusations of financial corruption and cover up, improper elections, conflicts of interest, denial of representation, failure to represent, discrimination, harassment and retaliation. It’s a Declaration of Independence-long list of transgressions. Many of these explosive allegations, unbeknownst to Re, are corroborated by hundreds of emails sent between and among the GRCC union’s Executive Committee members between March and July 2012. The emails were turned over to AdjunctNation in response to a July 2012 Freedom of Information Act request. The emails not only implicate the union’s Executive Committee members in efforts to withhold information about the theft of union funds, and to thwart efforts by the school newspaper to report on the story, but show AFT Washington President Sandra Schroeder has been deeply involved in many of the discussions concerning the suspect decisions made my the local’s union leaders, as well. AFT Washington President and AFT national higher education program policy chair Sandra Schroeder has much at stake should her involvement in the GRCC union local’s handling of the Phil Jack theft be scrutinized. She would also have a difficult time explaining her involvement in the local’s retaliation against several members of its adjunct faculty. Both issues could raise uncomfortable questions for Sandra Schroeder in Washington, DC at union headquarters. Did national higher education union leader Sandra Schroeder encourage the United Faculty Coalition leaders to refuse to cooperate with police? Did she and United Faculty Coalition leaders collude with Phil Jack in an effort to keep a lid on the situation and/or to protect Schroeder and her protégé, Jack? In March 2012 union leaders informed the membership that former president Phil Jack, pictured left, had stolen union dues money in excess of $9,000, a crime that would be prosecuted as First-Degree Theft, a Class B felony in Washington State, according to legal experts there. Class B felony theft is punishable by a maximum prison term of 10 years and a maximum fine of up to $20,000. In April 2012, adjuncts at Green River Community College contacted AdjunctNation when their own Freedom of Information Act requests related to the theft were met with resistance by the college’s Information Office. AdjunctNation followed up with several Freedom of Information Act requests, and our requests were not denied, but rather complied with over a course of months, after a protracted battle with the college’s union president—who initially threatened to sue to keep the requested emails secret. Kathryn Re, a colleague of Dr. Keith Hoeller, together with a group of other adjuncts at the college, have been pushing for greater transparency with respect to the local’s finances, equal representation, a fairer dues structure, as well as prosecution of the union’s immediate past president, Phil Ray Jack, for his embezzlement of union funds. In May 2012 Re and Hoeller, went to the local police to press charges against Jack. They did so because current United Faculty Coalition president Mark Millbauer had steadfastly refused to cooperate with police in their investigation. Phil Jack meanwhile left Washington State to start anew in Colorado. Emails turned over to AdjunctNation show Millbauer and other union officials communicated with Phil Jack about his crime and how he’d like the theft explained to the membership, and even inquired about setting up a payment plan for Jack’s convenience so that he could repay the money he took with minimal difficulty. It’s not clear these arrangements were shared with the membership, or that Jack is making his payments. It has been alleged that the union’s leadership never asked the membership whether Jack should be prosecuted. The emails turned over to AdjunctNation also show the UF Board in damage control mode, and worse. For the past two decades, Washington State part-timer Dr. Keith Hoeller has been a lightning rod for the movement to recognize what Hoeller argues is the inherent professional conflicts of interest between full-time and part-time faculty represented in unified locals—locals often controlled by full-time faculty. Full-time faculty, Hoeller has argued, have little incentive to bargain in the best interests of their part-time faculty colleagues, and often do not. Part-time faculty have little recourse, because full-time faculty union leaders are often department chairs. As a result, Hoeller, pictured right, has continually argued for decades that union contracts hammered out in Washington State have given full-time faculty larger raises, better benefits, and allowed full-time faculty union members to strip their part-time faculty union colleagues of courses, virtually at will, by teaching overloads. This problem is by no means confined to the AFT’s locals in Washington State. NYSUT, a New York AFT local, has put forward similarly lop-sided contracts as “successes,” where equal percentage raises for part-time and full-time faculty are fobbed off as fairly bargained wage increases. However, Keith Hoeller doesn’t live in New York. As the only national organization dedicated exclusively to advocating for adjunct and contingent faculty, NFM is committed to supporting these faculty members, whether within the context of a union or not. We agree with Keith Hoeller that any union that claims to represent adjunct and contingent faculty must do so concretely and without subjugating the rights of any contingent faculty members to full-time and/or tenure-track faculty. It is long past time for the higher education community to come together to address the contingent faculty crisis once and for all. If the formation of a national faculty union accelerates that process, then that can only be a positive step. No doubt such essays prompted Sandra Schroeder to refer to long-time union member Keith Hoeller as “anti-union,” in an email to Mark Millbauer sent in April 2012. Hoeller’s talk of an adjunct-only union might scare the daylights out of national higher education union leaders who have seen tenured faculty membership shrink. Non-tenured faculty now account for a whopping 70 percent of the 1.6 million college faculty teaching in America. A national adjunct union, properly run, could not only compete with AFT, NEA and AAUP locals, but could poach their adjunct members, then crush the full-time faculty in negotiations thus turning the tables on full-time faculty union members who have enjoyed the lion’s share of money and perks negotiated by full-time faculty union leaders for themselves and their full-time union colleagues. Keith Hoeller has spoken out at countless conferences, served on (and resigned from) several boards of national labor organizations and written dozens of op-eds. Ask Hoeller and he’ll tell you that his outspoken support of Adjunct Home Rule, as it were, has earned him the enmity of American Federation of Teachers officials, American Association of University Professors officials, not to mention the leaders of his own state and local AFT affiliates. It’s a long list. Has a lone middle-aged part-timer really provoked the ire of so many powerful people in the higher education union movement? In 2011 Hoeller launched an independent adjunct faculty association at Green River Community College to rival the union. The United Faculty Coalition represents only 40 or so of the college’s 303 adjuncts (all of whom pay union dues, however, to the local). Just as it might be easy to dismiss Re’s accusations as the sour grapes of an adjunct, it’s equally easy to dismiss Hoeller’s allegations of persecution and retaliation as paranoia and self-aggrandizement. Until, that is, you read the emails about Re and Hoeller’s advocacy efforts sent by the UF Board members to each other. In response to a second FOIA for emails sent using any grcc.edu email address about AdjunctNations’s July 2012 FOIA, it was revealed that Mark Millbauer had threatened to “go to court” and obtain an injunction to keep emails, which he claimed were “union business,” secret. It took AdjunctNation 6 months to force Green River officials to comply with the law, and included the help of the Washington State Attorney General’s Ombudsman, Mr. Tim Ford. Millbauer’s union never produced an injunction to keep the “union business” emails secret, and college officials searched Millbauer’s college email account, among others, and turned over hundreds of pages of emails mentioning Hoeller during the months of March-July 2012, including emails between Millbauer and Sandra Schroeder. The emails are damning and support many of Kathryn Re’s accusations made in her January 28, 2013 letter to NEA President Van Roekel. The emails give substance to Keith Hoeller’s long-time claims that Schroeder has been dismissive and suspicious of his efforts to improve the lot of the part-time faculty members in his state, in the AFT Washington, and at his own institution. In April 2012 Hoeller’s adjunct faculty association organized a teach-in, and the emails between the UF Board members flew fast and furious. They struggled to find a way to undermine Hoeller’s event so that it did not appear as though the UF was being “pitted against Keith which is exactly what he wants,” wrote Humanities Division Chair Will Scott to his UF Board colleagues. Scott sent this email just a short time before he went on to file a complaint against Hoeller for refusing to allow a quickly scheduled additional evaluation of his teaching. Hoeller feared he was being targeted for dismissal by his own union because of animosity surrounding the formation of the competing adjunct faculty association. Because we have been asked by several people, we want to clarify that the teach-in….is not being sponsored by or affiliated with the UF or any other official GRCC organization. That being said, the topics being discussed are important ones. UF would have been willing to co-sponsor such an event if asked. We have been in the process of developing out own outreach program for contingent faculty (or adjunct whatever term you use) faculty. Hoeller was then forced to rebut Will Scott’s complaint against him to his union’s Executive Committee, composed of Scott, Millbauer and Hoene, among others. Will Scott not only participates in the discussions via email that go on about whether the union will agree to represent Hoeller in his fight against Scott’s complaint, Scott and Millbauer discuss how to best proceed against Keith Hoeller by finding “past practice” evidence that will undermine Hoeller’s grievance. In early June 2012, Hoeller filed a complaint against Will Scott, alleging voting irregularities at a Humanities Division meeting. A flurry of emails between Mark Millbauer, pictured right, Will Scott and grievance chair Jaeney Hoene concerning Hoeller’s complaint confirm Kathryn Re’s allegations that the union’s leaders are entangled in many conflicts of interest that undermine their ability to represent adjuncts equally. Hoene, of course, had contacted both Scott (a party in the complaint) and Millbauer via email hours earlier to work out her role. On June 5, 2012 emails show Scott and Hoene strategizing together on how to best neutralize Hoeller’s complaint. In early June, Hoene was still serving as the union “grievance chair” handing the complaint lodged against Keith Hoeller by Will Scott related to the evaluation scheduled which Hoeller contended was not required to allow under the terms of the union’s contract. Millbauer was urged to show “resistance” by his fellow union leaders, emails show. Re’s allegation that she was stonewalled is corroborated by emails sent by union board members discussing her requests for financial documents. On June 5, 2012 Millbauer sent her an email that included the assertion that “I can’t freely send that to you. This was reaffirmed to me by the auditor just again today.” Auditors, of course, provide audits; they do not control with whom the information is shared or how. Millbauer offers to show the audit to Re, but refuses to give her a copy. Other emails exchanged between the union’s Executive Board members confirm Re’s suspicions that financial information was withheld in retaliation. What the hell? I’m very uncomfortable giving her any more numbers, especially audit information since she has proven she likes to “broadcast” anything and everything….What’s wrong with just telling her NO!!? At this point, with all UF has gone through this year…I’d be happy to tell her to take a long walk off a short pier. I’d also like to ask her to resign her membership (just a wish). Full-time tenured faculty members are allowed to teach courseloads that surpass what is allowed in the union’s contract and that cut into the classes available for part-time professors. He also says, among other things, that adjuncts are not routinely invited to the table during discussions about issues that affect them and that his union has violated various policies outlined by the national association. The NEA refused to comment when The Chronicle of Higher Education came knocking. They also refused to comment when InsideHigherEd.com asked about Longmate’s letter. This is the worst possible moment for NEA officials to close ranks and pretend that the public, higher education and their own members don’t deserve a thorough explanation of how the NEA intends to respond to Jack Longmate’s formal complaint. Jack Longmate has launched the first shot in what could be a fight on behalf of adjunct faculty that could change the shape of higher education union representation for hundreds of thousands of people. Will Van Roekel ignore Kathryn Re and the part-timers at GRCC who have pieced together a meticulous case documenting the ineptitude, arrogance and dishonesty of their union leaders? If, perhaps, it were just Re’s word against that of Sandra Schroeder and the UF Board members, Van Roekel could chalk it up to a family dispute. However, the hundreds of pages of emails turned over to AdjunctNation could be used as evidence in a lawsuit against both the state and national leaders. That lawsuit, as Jack Longmate alleged in April 2011 and Kathryn Re alleged on January 28, 2013, could conceivably argue Washington state and Washington DC union leaders were made aware of the many conflicts of interest, many instances of unequal or simply non-existent representation, and ignored those complaints. The emails turned over the AdjunctNation could, potentially, be used to argued UF Board union leaders colluded with Sandra Schroeder and each other to withhold fair and equal representation, and colluded to damage the professional reputation of one of the union’s own members—Keith Hoeller. “When in the Course of human events, it becomes necessary for one people to dissolve the political bands which have connected them with another, and to assume among the powers of the earth, the separate and equal station to which the Laws of Nature and of Nature’s God entitle them, a decent respect to the opinions of mankind requires that they should declare the causes which impel them to the separation.” Green River Community College faculty member Kathryn Re’s January 28, 2013 letter to Dennis Van Roekel is nothing short of a Declaration of Independence in which she makes clear that the history of the present union at Green River Community College is a history of repeated injuries and usurpations, all having in direct object the establishment of an absolute Tyranny over the college’s 300 adjunct faculty. To prove this, Kathryn Re has submitted Facts to a candid world. Using the Freedom of Information Act, AdjunctNation has secured 600 pages of written documents that support many of Kathryn Re’s allegations. We are planning to post an archive of the GRCC UF Board emails, as well as Re’s letter to Van Roekel and her written evidence in support of her request for a trusteeship. I’d like to clarify a couple of things – I was hired Sept. 2011 to teach three classes at GRCC. They seemed to be in a bind, and I bit the hook, not knowing it would be hook-line-and-sinker. Soon after my hire, I was enlisted to help with a teach-in on the Attack on Higher education. I ran a film series for that year-long teach in. I also was on the first panel at the school, Oct. 5, 2012. Additionally, I joined the union there, and I also spent valuable time writing up articles on all events on campus tied to the teach-in, and even when Cornel West cam to campus. Additionally, I also cross- published and rewrote pieces for Seattle’s Real Change News, a famous street paper. You know, trying to be one with the team, publicize GRCC’s nascent student activism around a very huge set of issues tied to being screwed in the education system. I even worked with Working Washington, an off-shoot of SEIU’s Fight for a Fair Economy. You know, Occupy. Truckers striking for fair wages. Putting fire under the butts of bankers and Bezos and Wells Fargo types. Students came out and protested, faced down batons and SWAT teams, and got interviewed by the media. WHAT WE should ALL be doing to engage student learning, student inquiry, student participation. Go here for more on West ‘s visit . Note that I wrote killer pieces for the GRCC Gatornet, on-line stories that had a hell of a lot more depth than most of the stuff on that GRCC news service. My time, free, and, not much appreciated by anyone but the few organizers of the events . . . and students! Heck, I even got GRCC publicity statewide when Dorli Rainey came to speak – THAT was after the school dumped me. I’d say that not getting rehired and basically strung along by the department chair who is also the Union Grievance person is business as usual. It’s the broken system that is the ugly pus-filled hubris wart on the backsides of folk like that, and like those on guys like this Mister AV Jeffery, who in his ultimate wisdom proves the point many adjuncts make about punitive evaluations and how we can be red-flagged and pink-slipped with the basic default – “it was a drop in expected enrollment . . . you are not as senior as the others.” His final kick, “It happens,” shows why this Mister AV Jeffery is a bit lower on the derriere where the pus-filled wart of adjunct and part-time faculty exploitation resides. “It happens!” First, I have never heard of some adjunct hanger on playing union water boy having privy to why people get hired or not. In fact, that would be a breach of the department head’s duty to keep all personnel issues sealed, and certainly not to be bandied about in these lazy emails you exposed. A breach of HR policies. Unethical, wrong, and retaliatory. This is just another waste of my time, dealing with this Mister AV Jeffery and his limp comeback her posted here. He wasn’t part of any teach-in around the attack on higher education, and he certainly wasn’t down there for the fight for a fair economy at Montlake Bridge. And, he was not involved in organizing the GRAFA teach in. I can only hope he had zero to do with any communication with my former department head about me. And if he did, where is his allegiance? I never got notification from him, the great adjunct faculty union water boy, that there was even any discussion about my case – which he says is based on enrollment declines and not my POLITICAL activities, i.e., empowering students to NOT BECOME the pus in that proverbial wart wherever they may find themselves. Look, this GRCC English department is small-time, embarrassing. I’ve seen the same thing happen at other schools where English Department (and philosophy department types) ADMIN-wannabes cave and in fact display that middling and sucking up character that is certainly not conducive to recruitment of adjuncts to join a FT union. I never knew this guy was part of my grievance chain of command. I never asked him to investigate why I never got even a single class. I was hired Sept. 2011 with all sorts of –“Oh, there is almost certainly going to be at least two classes for you.” Look, I was put in limbo dong the PT work, but I would have chucked the offer if I had known it was going to be for three months. I will say that all of my personal expensive books, many texts, plenty of student files, and other items were left in my cubbyhole office space over the Winter break. Not a great feeling over the December break to come out to the GRCC campus from Seattle and pick up my stuff, since I was on the outs, and given no real excuse. So, I went over to the campus in January to pick up my stuff. Lo and behold, I was told by the Sergeant Major, the department secretary, that, wait, “I think all of that has been thrown away.” That’s maybe two photocopy paper boxes worth of valuable books, DVDs, and, STUDENT files, and student letter to me. Thrown away? Two autographed books written by friends. This is their humanity, fully exposed, warts and all. I called the Dean, and she just yammered her deanlet $90K a year yammer, and, well, I was promised they would look into it, and, months later, now more than a yearlater, the stuff is gone. So, that’s the GRCC story, in microcosm – they throw away/ get-rid-of/ confiscate files, books, DVDs, and other personal and professional items. There was no final recourse. These are inhumane motions from yet another set of warts on the ever expanding derriere of Academe in its treatment of the majority, us, part-time and contingents. …. And its treatment of the real majority, the students. So, I’d say GRCC is emblematic of much of what is wrong with the AFT – the union. Look what they have been involved in lately : Pat, run the piece on the AFT magazine, American Educator, running a hit job of Howard Zinn’s People History of the United States and the magazine’s editor refusing to run a counter article. AFT is espousing the warped idea that ZInn is rotten to the core, and his narrative is not for the eyes, ears and mouths of K-12 students. AFT’s national president is calling for a National Bar Exam “type thing” for teachers before they can get a job. Another flogging of the profession. Why do I bring these two issues up unrelated to the GRCC bunk at hand? Well, it speaks to an out-of-touch union that wants stiff-arm loyalists and compliant water bearers. So, Pat, again, thanks for keeping this GRCC set of broken plates spinning. I am sure you won’t be getting too many comments from the non-unionist union members from that neck of the suburbs. But if you do, we’ll be here in the wings ready to out their crass and hollow lack of humanity, and I’ll personally be the lance for that festering pus-filled wart that’s located you know where. Oct 26 – Teach-in: Show Me the Money! I, too, have been an adjunct for a while at more than one community college. I am now retired from full time work and supplement my social security will part time teaching taking whatever classes I can get. I love working with community college students and enjoy my work, but am greatly concerned by the unaddressed issues in this article. I cannot understand how these practices can continue without being addressed. I wonder why communication systems are not working and why these issues continue to be ignored. How about fixing the broken systems really communicate without negativity. Let’s put our heads together and work towards viable solutions— especially obvious blunders. 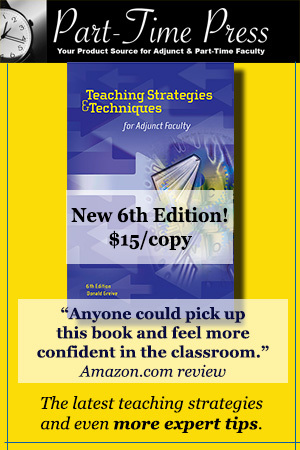 Adjunct faculty issues need to not just be heard but dealt with. After all, we are all on the same team and full-timers and part-timers have much more in common than not. Perhaps the solution is a separate union designated strictly for adjuncts and their issues and concerns. The present system somehow is just not working. I worked there — Green River CC — a whopping one quarter. My goal –living in that absurd city, Seattle (high rents, big mouthed democrats talking about the creative class and knowledge economy, tons of homeless folk screamed at by big mouthed Republicans, a state that never refused a tax loophole for a millionaire or corporation, city of shoot first, ask the dead victim later cops, endless consumerism wrapped in Whole Foods fish paper) – was to hang onto a teaching gig – even at Green River, and continue looking for Big Boys’ work. That was an hour trip sometimes, one way. GRCC is in the middle of exurbia. It exploits the living hell out of foreign students. It’s another school with retrograde PhDs and others slapping themselves on the back saying, hmm, get this: GRCC is the Harvard of the West. In any case, I went there with credentials, the licks as a teacher, a journalist, radio show producer, someone with many professional arrows to shoot down the vulture of ignorance swooping up America (and foreign) students. These tenured folk act as if we are children. They are I many cases locked in their own bourgeoisie lives. They are not the grand teachers they all think they are after gaining that TT pip on their sleeves. The more of them at the top, and the more of them trying to be union-like, the worse it is for true activist adjuncts. These people really lack a certain human and moral code. They do not really care about our lives – adjuncts. I’ve been around the block, so that statement is not some bombastic pangs of hurt for not being rehired, which is another word for “fired.” I’ve taught in prisons, in gang-prevalent barrios, for at-risk youth, for military, for veterans of wars, for refugees from Central America, and many, many adults returning to school because their jobs have been gutted. I understand people – one of the perks teaching so long. We end up as amateur sociologists, psychologists and special education apprentices. The people who call themselves TT, hands down – there were several exceptions, to be sure – and those who call themselves deans and heads, well, they are something else. Prozac or characters from a Margaret Atwood novel. Delusional, and, well, inhumane. What I did with Keith was work to get adjuncts interested in collectivism, since most I talked with hated the union, hated paying dues, and had no idea what the union did. I joined the union since I am a unionist. But early on I could tell the union there was not a union of workers. They are bosses first, overlords second, patronizing pompous fools third, old school top down thinkers fourth, and, well, just out of touch fifth. What they did when I got involved in adjunct issues, meeting with Keith and others in the GRAFA meetings? What sort of stupidity did the FT union wannabe thugs due? What did their sycophant PT union wannabe water bearers do? Attacked us, sent inane emails out, tried to divide and conquer, and tried to caress and knead their big empty ball of dough into something resembling a flat, lifeless pizza crust from which to serve their endless airless rhetoric as to why having a breakaway adjunct discussion group was akin to treason. So, Keith, kudos to you and Ms Re and for pugnacity shown by others at those GRAFA meetings, perfectly sound, legal, legitimizing, and empowering meetings that culled history, the lay of the adjunct land in WA and ways to communicate our frustrations to the little dictators who run the union and who hire, fire, and have the power to spit on our graves. I don’t want to go on and on about GRCC. It becomes way to pedestrian if we carry on with personal character analyses with these folk, with the AFT union reps ruling the roost here in WA. Because, to be honest, this is a major disease that is infecting other unions through the adjunctivitus land. And, to be frank, it has to stop. If adjuncts have to break away from the soft, gooey rotten middle, then so be it. I am a revolutionary, anti-libertarian, and I fear no one. I have never met a Republican that was good overall – I was a reporter in Arizona in the ’70s and one in Texass in the 80s and 90s, so I met many, many libertarians and republicans. I’ve met so many blue state democrats who are naïve, fraidy cats and stiff arm experts who salute the flag of incrementalism and let’s-go-with-consensus-thinking. So, I come at this from a true unionist POV. Radical and not anti-union on bit. Get this letter below. In a piece I just wrote. It’s a real letter from an adjunct. Not to be names, and nothing to do with GRCC or WA state. But, it’s universal. It’s what I’ve heard in so many words from plenty of older adjuncts when I was 24 and an adjunct. Now, I am that older one, hitting 56 tomorrow. I know, just know, that some of those deans, and ADMIN class and FT union class at GRCC, or anywhere USA, would say all sorts of sad, empathetic, a few crass things. But the bottom line is – you help your own kind. You break rules, shunt HR provisos to the toilet. You beat the system and save a life or two by being oh so different, oh so less than a Little Eichmann or tin soldier for some big fat Lazy Boy retirement future you think you have a bead on. Unfortunately, these sentiments will grow, and the letters will multiply. Is a union made up of the cast of Dickensian characters cited in the GRCC series capable of dealing with truths and realities espoused below? NO. After this letter, an article blurb about a Korean adjunct who killed himself. These are the “conference” topics we need to have, not all that BS post-modern, hyper digitalized mumbo-jumbo that’s emanating from all those orifices. “Sometimes I feel like it’s all over. Like Willy Loman in Death of a Salesman, I am a 50-something year-old man, an adjunct, who cannot keep up with the times. I adapt to each new ”learning platform,” accept whatever classes I am given from semester to semester, and use whatever text I am required to use. Students like me, and when I have gotten feedback from supervisors it’s always been positive. I teach sociology at two community colleges: one online, another I commute to. A few weeks ago I had the chance to commute to a for-profit university, teaching 5-hour classes. It was too much for me to handle though–which led to my first ‘crack up.’ I know there are other freeway flyers who are experiencing this. And this is the direction education has been going for decades. Schools are businesses and education is becoming more and more like low-wage factory work. I ‘add value’ to my classes, but it’s not enough to get full-time work. And I wonder if it’s worth continuing this struggle. Food stamps and my partner’s family are the only two things keeping me off the street. Rents are high around here, and manual labor, which I have done before, would not be enough to pay the rent. I could move…again. I know I am not worthy of empathy, especially in these times–times of struggle for many people, people who have it much worse. I have seen those who were better teachers and those who had more experience not get the increasingly rare full-time job. 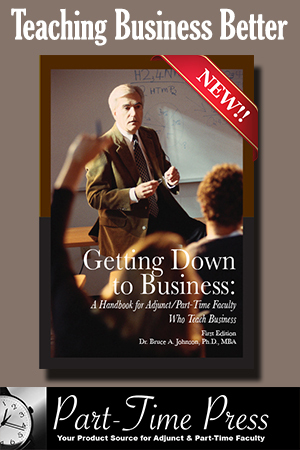 I know most adjuncts don’t face the struggles I do; many are retirees using adjunct work as supplemental income. Others have a second income in the family. Others are transitioning to other careers. I’ve heard people say that suicide is a selfish act, but I wonder of others would be better off…. I have signed and mailed off my life insurance policy. I really don’t have the skills for much other than academia; I was in the military for a few years, and worked in prisons. I’ve tried to be a union organizer, but am probably not fit to do the backbreaking work. Public service jobs are few and far between. I am assigned four more classes next semester, but it won’t be enough to pay for rent. I’m tired of this struggle. I think about suicide as my little world crumbles. My relationships crumble and it seems only a matter of time–in some ways life would end faster. I know in these times, there is little compassion for people who got Ph.D.s when there was “an oversupply” of advanced degrees. It’s only a lack of courage, and a small degree of false hope that keeps me going. “A 45 year-old adjunct professor of 10 years committed suicide by carbon monoxide poisoning in his home on May 25. The man, Dr. Suh had been an adjunct professor for Chosun University. As reported by Hankyoreh News, his 5-page will, written to South Korean President Lee Myung-bak, criticized the corrupt process of hiring tenure-track professors and the lack of job security. His will elaborates that during his 10-year attempt to be hired as a tenure-track professor, he was timelessly asked to pay nearly 60 to 100 million won ($50,000-$85,000) for employment. A former colleague of Dr. Suh mentioned that, “It is a well-known secret that monetary payment for professorship is one of the last requirements to be hired. Through this incident the treatment and hopelessness of part-time lecturers as well as the corruption amongst professors needs to be revealed.” Unfortunately for Dr. Suh, he didn’t have the economic ability to pay the cost for a professorship. Thanks for sharing so honestly about the challenges you face as you try to cobble together enough courses to pay the bills. Hey, Pat, please ramify the point that since we are at-will, and at the whim of these hormonal men and women, who use arbitrary ways of thinking and acting to exact their evisceration of our lives as professional workers, when we buck the system, rock the proverbial boat (when we challenge their immoral and rotten-to-the-core anti-collective bargaining actions)some of us have this HUGE black hole in our employment “records” or history. Since it is a buyers’ or hirers’ market — and believe you me, I just got notified that I was one of 301 applicants for one job — those hours and dedicated weeks and weekends we invest teaching for such low amounts end up wasted, or in some cases, used against us. GRCC paid me $3300 a class. I taught three classes. I had such a lousy schedule that I had to stay on campus 10 hours to teach two classes. No voucher for gas or parking decal or food voucher. These are inhumane people who live with spouses, have inherited “wealth,” and double dip by moonlighting (not all FT-ers are this sort of species, but many are). They treat us like cockroaches — they respect our tenacity, where we have lurked to survive and that will out-survive them who are generally limp thinkers . . . but they also think we are the lowest of the low for continually working and putting them to shame and some of them into fugues of guilt. This is a national example of back-stabbing and careerism and apartheid thinking that ends up ruining many of our job hunts since these so-called FT professionals would go to no ends to tinge our lives with their Scarlet Letter — A for Adjunct, but also A for Against the Status Quo Wage Slave BS propped up by FT faculty, FT faculty union reps, and FT union admin types who so-so fear a real workers’ rebellion. I just want to add that since these mini-Chicken Little FT-ers who have allowed HR, ADMIN types, Deanlets and their own ranks to allow for more and more slippage of tenure as a deserved reward for human and quality work, who have allowed the bosses to triangulate them out of real administrative work — faculty should be working on all aspects of campus, including how many toilets get installed, why soft drink contracts should be ended and when buildings go up and why and where — they are not even quasi-average spokespersons for us, the New Faculty Majority. I’ve seen PT faculty at Gonzaga, Spokane Falls and Spokane Community Colleges, at UT-EL Paso, Park College, El Paso CC, and elsewhere teach circles around many FT-ers, and certainly devote more to the community of the college and the communities tied to the college. GRCC’s sordid tale as you have unfolded is replicated daily in Washington State at other CC’s, at the five state colleges, at the 11 private non-profits, and especially at those for-profit things called language schools and other things like arts schools. So, the more we put up with this caca, the more these floating amoeba — the bad apples — float to the top and end up ruling their guano-encrusted roosts. Fight hard, and some of us are sacrificial lambs, or in my case, as one of my Iraqi GRCC students said, Lions (Hader, Haider, Haeder is lion in Arabic!). Anyone who is interested in improving the working conditions of adjuncts owes a debt to Keith Hoeller for his contributions over the last two decades. And thanks as well to P.D. Lesko for this exemplary series on the circumstance at Green River. If there was more journalism like this, investigating the abuse (and the abusers) of adjuncts and naming names, there would be far less abuse of adjuncts. @don thanks for the kind words. 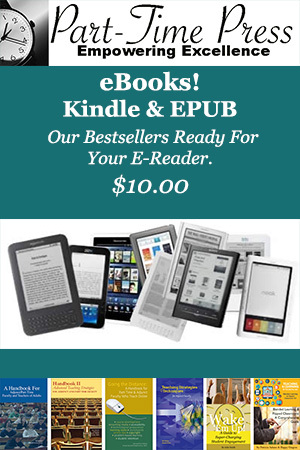 I submitted this series of articles to the Education Writers Association Award competition. It is, indeed, a compelling story. It took six months for the union’s president (Mr. Millbauer) to cooperate fully with the FOIA request. That, alone, is unusual. When I FOIAed the police reports about Hoeller and Re’s attempt to get law enforcement involved, the request for those public documents was filled in less than three days by the City of Auburn’s Information Office. That request also included emails sent by the Mayor of Auburn (who is a GRCC Trustee). This is beyond belief: oh what a tangled web we weave… It seems that the adjunct-uniongate scandal keeps getting worse, yet no one knows it. This is what is truly sad. News like this is horrifying, yet because it belongs to Academia, no one outside our realm knows of it. How can scandals like this go on and no one outside do anything of consequence? Sounds to me like both state teacher unions should be put in trusteeship, I’ve always suspected such venality, but here’s the proof! “Division chair and union leader”, “division chair and grievance chair” . This pattern is unconscionable. How can you file a grievance if you’ve been fired by the division chair who is also the union griever? This happened to me. I thought it was illegal to be in the same union with your boss. As for non-representation, the NEA local at Highline Community College near Seattle pretends part-timers don’t even exist. There is no attempt to recruit among p-t ranks and no attempt to represent them. The union is of, by and for the minority tenured clique and has a symbiotic relationship with the administration to keep costs down by keeping p-t wages low. We have never had a contractual raise in the fifteen years I have worked at HCC. What increases we have had have been at the hands of the legislature or a citizen initiative. Jack makes a good point about the tenured faculty grabbing the “prime” courses as moonlights, which leaves the lesser attractive classes (and usually very few of them) for the adjuncts. As he notes, the folks at the college up in Canada have let their adjuncts have first choice, restricting the tenured faculty from taking those opportunities away from the adjuncts. As Paul Harvey used to say, what about the “rest of the story”? Such commentary is operating on the assumption that the core courses belong to the tenured faculty and the additional courses belong to the adjuncts. Thus, the tenured faculty are “raiding the larder” of the adjuncts by crossing into adjunct territory. Jack didn’t mention that the negotiations at the one college he referenced set the basic salary for the tenured and “full-time” faculty at about $90,000 per year. When I was an adjunct teaching about 20 classes per year on several campuses, I was lucky to earn $40,000 per year, and my family of six lived in a two-bedroom “home” of about 900 square feet. My children qualified for the federal reduced and free lunch programs at their schools and we were granted waivers for little league team member fees. When I was hired full-time, my income jumped to $52,000 per year to teach nine classes. However, that still put us on the fringe of federal assistance. Fifteen years later, my salary has zoomed to the maximum, about $57,000. Even if I do six moonlights a year, I still cannot reach the $90,000 level guaranteed those folks at the one school in Canada. Without the moonlights, I cannot support my family. At the campus where I teach, in our building of about 25 teachers, every other tenured faculty member with a spouse or partner lives in a double income household, except for me. Even the ones without children in the home must rely on two incomes to have a reasonable lifestyle. If I am prohibited from taking on moonlights at my “home” campus, I will need to do so at other schools in order to supplement the base income where I am now. It seems like that wouldn’t benefit the schools at both schools, and I would be taking away adjunct “property” at those other places. The real issue that has divided the faculty and created this social class struggle mentality really comes down to the funding of higher education, not to mention funding of all our education system. The “college up in Canada” (Vancouver Community College) does not “let their adjuncts” (who are called “term” or “non-regulars”) “have first choice.” The primary determinant of workload is not full-time or part-time status but seniority. All faculty, permanent and probationary, full-time and part-time, accrue seniority in the same denomination (service days). Union members can see how they stand relative to any other faculty member in the college, or in the department, or in their specific teaching area, which, in and of itself, provides a measure of peace of mind. It is possible for a part-timer to be senior to a full-timer and in that case, the part-timer could be given first choice. This contrasts sharply with the college where I teach, Olympic College in Bremerton, WA. Our Collective Bargaining Agreement spells out seniority for full-time faculty as being date of hire, but that definition doesn’t apply to adjuncts. We adjuncts accrue no seniority; we now have what is called the “Priority hiring list” in reference to specific classes, not the individual, and it’s operates on a sort of treadmill basis: if one hasn’t taught a given class the requisite number of times within a given time period, one falls off the list for that class. And, as Andrew Jeffrey pointed out in his comment about this article, even senior adjuncts end up not working up to the maximum allowable workload. It’s true that pay is better in British Columbia. It’s not just at Vancouver Community College where the full-time rate is about $82,000 I think. There’s a provincial wage scale, so the high wages are not just because Vancouver is an expensive city. But I don’t think there is any reason why we in Washington State can’t come close to replicating the working conditions that exist across our northern border, and that goes especially for changes that don’t require public investment. But one difference is faculty solidarity and the union culture. As this article shows, we in the U.S. with our bifurcated two-tier system, with tenured full-timers ruling the roost and most lowly part-timers learning how to be seen but not heard, are a dismally polarized lot. But in Vancouver and other places in British Columbia, there is a much stronger sense of solidarity. The Vancouver Community College has gone on strike a number of times over the years—including a one-day strike last spring, and has held a number of strike votes, which has had the effect of winning the working conditions that U.S. adjuncts can only dream about. One reason why U.S. faculty unions are so lackluster is that they don’t have much of a vision, and certainly no plan to bring about equality for non-tenured faculty. At locals, every three years or so, they’ll circulate a survey or two to faculty to gauge priorities, some of which will be taken to the bargaining table. If full- and part-time faculty were to work together, we could be more effective in making our case. But if working together for adjuncts means pulling for more full-time faculty positions, which will displace part-timer jobs, or pulling for a part-time faculty salary increase, which will have the effect of making teaching overloads more attractive to full-timers and thus undermine adjunct jobs, or pulling for incremental pay step increases even though no incremental pay steps have been bargained for part-timers, such ideas would seem unlikely to compel cooperation from all faculty. Our best shot at a plan is the Program for Change (http://vccfa.ca/newsite/wp-content/uploads/2012/05/ProgramForChange_09-28-2010_001.pdf). It offers job security for the non-tenured, and proposes milestones that can be celebrated as they’re achieved. But it is clear from P.D. Lesko’s piece that such benign words do not describe the faculty union climate in Washington state. Unions abuse their power when they use it to retaliate or bully or marginalize their enemies or union members. Lesko describes union involvement in the workplace that is difficult to believe, such as the case of an adjunct who was targeted by a complaint from his Division Head, who, at the same time, serves on the union’s executive board. Lesko found e-mails where, on the one hand, the division head took part in discussions about whether or not the union should represent the adjunct along with other evidence that the same person discussed how to proceed against the adjunct. Schroeder didn’t attend the workshop, but she should know that one of Cosco’s first points was that at Vancouver Community College, full-time faculty are not allowed to teach overtime (overloads) in order to protect the jobs of part-timers. When I published an editorial recommending that policy, Olympic College union leaders attacked me for suggesting this idea that could deprive full-time faculty the option to earn extra income. As Schroeder is an AFT leader of national stature, her presumption that the unions and ideas promoted by Keith Hoeller are incompatible reflects a sorry state of union awareness of reform for non-tenure-track faculty. As an adjunct activist and former union officer, I can attest to the retaliation that befalls adjuncts who seek real change. What is needed indeed is a trusteeship for a period to ensure that true democratic practices can be instituted. @Jack thank you for this thoughtful comment. The emails are, indeed, shocking and it’s clear now why the union leaders fought for months to keep AdjunctNation from getting them. I’d hoped that by submitting a FOIA request for any emails from any address TO Mark Millbauer that we would have an opportunity to see Ms. Schroeder’s side of this story. What we see, however, is a very disturbing pattern of abuse of power on her part and unethical behavior.